James Cohan Gallery is pleased to present an exhibition of video works by Bill Viola in conjunction with the presentation of The Tristan Project at Lincoln Center on May 2nd and 5th. This acclaimed production of Richard Wagner's opera Tristan und Isolde is a collaboration between Bill Viola as video artist, Peter Sellars as artistic collaborator, and conductor Esa-Pekka Salonen, with the Los Angeles Philharmonic. After its presentation in Los Angeles at the Walt Disney Concert Hall, December 2004, the fully staged production premeired at the Paris Opera in April 2005. Bill Viola created a four-hour video that is projected during the entire opera. Viola has written that Wagner's opera tells the story of a love so profound that the lovers must ultimately transcend life and their material bodies to fully realize their union. The images in this work are intended to function as symbolic, inner representations of the opera's theme, tracing the movement of human consciousness as it surrenders to an absolute, all-consuming love. The gallery will present three video works from The Tristan Project. Central to the exhibition is the large-scale video projection and sound installation entitled, The Fall Into Paradise (2005). The piece begins as the tiniest point of illumination possible in video, a single pixel of light at the center of a black screen. Imperceptible at first, this point begins to grow and change. After some time it becomes apparent that the light is actually an image of two lovers intertwined, clinging to each other and growing larger as they move towards us. As they approach, their distinct identities are revealed: a man and a woman locked in an embrace with arms encircling each other. Without warning they crash through a previously invisible surface and plunge into a pool of water in a turbulent explosion of light and sound. Isolde's Ascension (The Shape of Light in the Space After Death), (2005), a large plasma-screen work, is a study of light. A meditation on the deliberate act of letting go of the body in the last moments before death, the work begins with a long shaft of light quietly undulating in a dark underwater space. Suddenly, a fully dressed woman crashes through the surface. Her body slowly ascends and as she disappears, the disturbance in the water slowly returns to equilibrium. Passage into Night (2005), a 50-minute silent video, displayed on a plasma-screen, will also be shown in the front gallery. It documents the approach of a female figure across a desert plain in the intense heat and light of the midday sun. Beginning as if in a mirage, a tiny form gradually grows in size until it is apparent that a woman is walking toward us. The extreme heat distorts the air that surrounds her as she travels inexorably closer. Bill Viola (b.1951) is internationally recognized as one of the premiere artists working in the medium of video. For over 35 years he has created videotapes, architectural video installations, sound environments, electronic music performances, and works for television broadcast. Viola's video installations—total environments that envelop the viewer in image and sound—employ state-of-the-art technologies that are distinguished by their precision and direct simplicity. His single channel videotapes have been broadcast and presented cinematically around the world. Viola lives and works in Long Beach, CA with his wife and long time collaborator, Kira Perov, and their two sons. 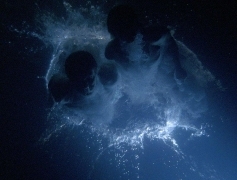 The video of Tristan und Isolde was produced by Bill Viola Studio, Kira Perov, executive producer, in collaboration with the National Opera, Paris, the Los Angeles Philharmonic Association, the Lincoln Center for the Performing Arts, the James Cohan Gallery, New York and Haunch of Venison, London. To access press and other relevant articles, please consult Bill Viola's artist page at http://www.jamescohan.com/artists/bill-viola. For further information about the exhibition, please contact Jane Cohan at jane@jamescohan.com or telephone 212-714-9500. Please visit www.lincolncenter.org for more information about The Tristan Project. Tuesday, May 1, 7:00 pm WORKS & PROCESS at the Solomon R. Guggenheim Museum, New York 1071 Fifth Avenue at 88th Street, New York The fully staged production of Tristan und Isolde premiered at the Paris Opera in 2005. Gerard Mortier, Director of the Paris Opera, and Bill Viola discuss the creative process and present images and film clips prior to the Lincoln Center premiere. SOLD OUT. Friday, May 4, 7:00 pm A TRISTAN PROJECT Discussion, Stanley H. Kaplan Penthouse Rose Building, 65th Street and Amsterdam Avenue, 10th Floor, New York A Tristan Project discussion with Esa-Pekka Salonen, Bill Viola, Kira Perov and John Schaefer. FREE to Tristan Project ticket holders.